This article demonstrates how fire resistive glazing tested to ASTM E119 is safeguarding schools from radiant heat. Where there’s smoke, there’s fire. Where there’s fire, there’s an invisible deadly threat commonly referred to as radiant heat. When you warm yourself in front of a fireplace, you experience radiant heat firsthand. In small doses, radiant heat can be warm and welcoming, but the amount of radiant heat generated by an uncontrolled fire can be a serious threat to life safety and property. Fire-resistive glazing is designed to block radiant heat transfer from one building compartment to another. In order to specify the right type of fire rated glass for the application, it is important to look beyond the fire endurance rating (20/45/60/90/120/180 minutes) and focus instead on the overall performance of the glass. Fire-resistive glass, in combination with fire-resistive framing members, is tested for both fire endurance and its ability to limit a rise in temperature on the surface opposite the fire per the requirements of ASTM E119. Alternatively, fire-protective glazing, such as wired glass, glass ceramics and specialty-tempered products, is only capable of stopping the passage of smoke and flames.. These products are tested to NFPA 252 and 257 and are limited to 25% of the total wall area under current building codes. There are examples of fire-protective glazing products that have fire endurance ratings that exceed 45 minutes and yet fail to meet ASTM E-119 (the wall standard). Wired glass and glass ceramics have achieved fire endurance ratings of 90 and 180 minutes respectively, but neither can block radiant heat as required by ASTM E-119. Because of this, the use of these products is severely limited by building codes for applications requiring a rating beyond 45 minutes. In contrast, fire-resistive glazing, such as multi-laminates or glazing with a semi-rigid intumescent interlayer, not only stop the passage of smoke and flames, but they also block radiant heat transfer. These products are specified in applications over 45 minutes where meeting ASTM E119 is required by the code. Fire-resistive glazing has no prescribed area limitation and can be used in wall-to-wall and floor-to-ceiling applications when combined with an equally rated framing system. Fire-resistive glass products achieve the performance requirements of ASTM E119 by limiting temperature rise to less than 250º F above ambient on the non-fire side. This ensures safe egress even when fire is raging on the other side of the glass. The extra time these products can give people to escape or be rescued can mean the difference between life and death. 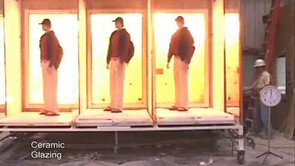 To see a test that confirms the value of fire resistive glazing compared to fire protective glazing, watch the “Can you feel the heat?” video.